The Financial Select Sector SPDR ETF (NYSEArca: XLF) has been leaping from one new recovery high to the next. But its Wall Street cousin, the SPDR S&P Bank ETF (NYSEArca: KBE), has been stuck in a 12-month trading range. 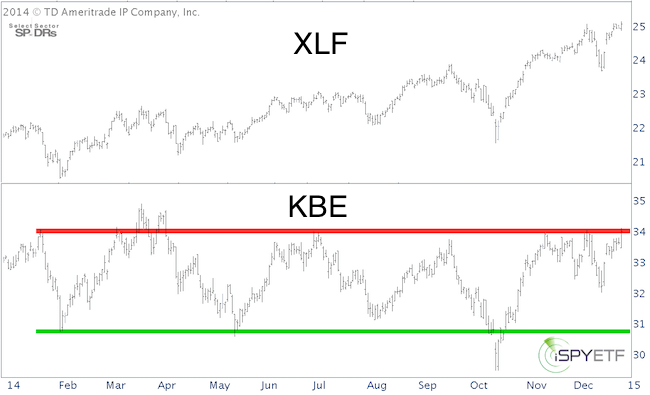 The chart below plots KBE against XLF. KBE is back at key resistance around 34. KBE is at an inflection point. Could KBE become the (sector) tail that wags the (broad market) dog? The S&P and R2K did hit new all-time highs and are close to their inflection point. I’m not sure if KBE will be the tail that wags the dog, but KBE confirms that the market should be watched carefully for either acceleration or temporary breakdown. It’s the time of year when stocks are expected to rally. 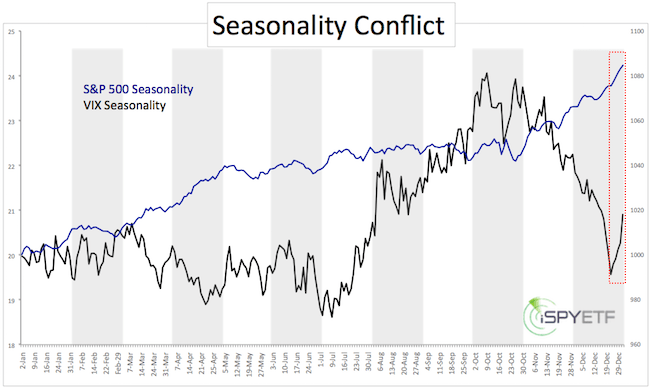 S&P 500 (NYSEArca: SPY) seasonality, based on data going back to 1950, confirms the tendency to end the year on a high note. At first glance, this looks like a good setup to short the VIX. However, S&P 500 strength does not automatically translate into VIX weakness, especially during the final days of the year. In fact, the VIX tends to rally in late December. The chart below shows that shorting the VIX during the ‘Santa Claus Rally’ period is not the most brilliant of ideas. 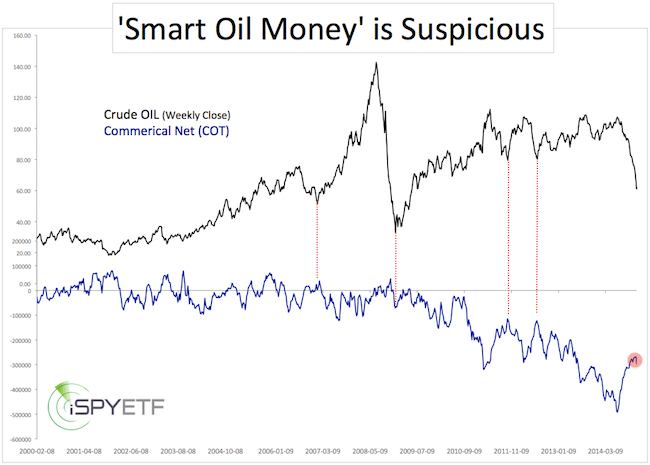 Is the Smart Money Buying Oil? If anyone knows fundamental supply/demand forces, seasonal patterns and the potential for curveballs, it’s commercial traders. Commercial oil traders work with oil in their day-to-day business. It’s the only commodity they deal with. Commercial traders make up about 60 – 75% of the trading volume in futures markets. That’s why they are considered the smart money. So, is the smart money buying oil? The chart below plots the price of crude oil against the net futures positions of commercial traders (as reported by the Commitment of Traders report). Commercial oil traders are almost always net short as futures are used as hedge against falling prices. The smart money reduced short exposure steadily as oil prices tumbled. In itself, that’s good news. However, net short positions fell to an all-time low and are still well below the levels seen at prior oil price trough. That’s not bullish. Although oil prices managed to inch higher last week, commercial traders added to their hedges (red circle). That’s bearish. Technical analysis shows an improving picture for the Energy Select Sector SPDR ETF (NYSEArca: XLE). Click here for detailed XLE analysis. But oil ETFs like the United States Oil ETF (NYSEArca: USO) and iPath S&P GSCI Crude Oil ETN (NYSEArca: OIL) have yet to catch their footing. Commercial oil traders are not yet convinced oil has found a lasting bottom. Unless we know something they don’t, it appears too early to buy. Falling oil prices in 2008 led to a stock market meltdown. It’s 2014, and oil prices are crashing again. Will stocks follow the 2008 script? We live in a complex world, and there are a number of correlations that may cause a surprise outcome. There is some concern that the drop in oil prices will push stocks into a bear market, similar to what happened in 2008. We live in a complex world, and here are some of the ripple effects caused by falling oil prices. A bear market is not necessarily one of them. According to the U.S. Energy Information Administration (EIA), the United States consumes about 11.5 billion gallons of gasoline and 567 million barrels of crude oil per month (based on 2013 data). Since late June, the price of regular gas fell from $3.8/gallon to $2.5/gallon. A $1.30 drop in gas prices translates into a monthly savings of almost $15 billion for U.S. drivers. Since late June, crude oil prices fell from $107/barrel to $58. A $49 drop in crude oil prices translates into a monthly savings of $28 billion. Without help from the Federal Reserve, the oil market just delivered an ‘economic stimulus’ that could be valued somewhere around $43 billion a month. 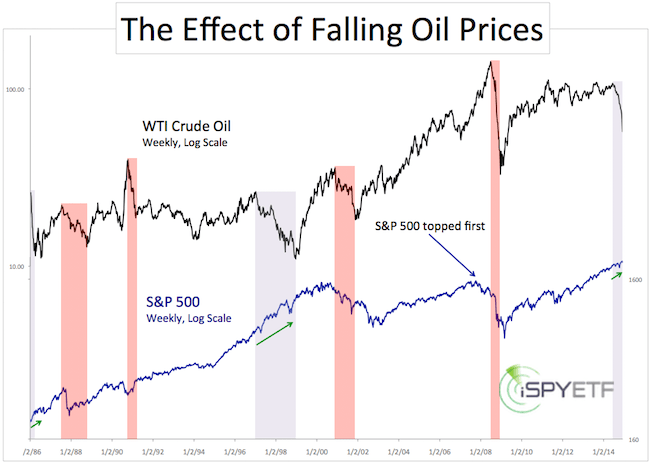 This year’s oil price collapse differs from the 2008 collapse relative to the S&P 500 (NYSEArca: SPY). In 2008, the S&P 500 topped before oil did. In fact, the S&P 500 recorded its all-time high in October 2007 and was already down 21% by the time oil topped on July 11, 2008. In 2014, the S&P 500 recorded new all-time highs five months after oil (NYSEArca: USO) started to decline. The chart below plots oil against the S&P 500 and shows that falling oil (NYSEArca: OIL) prices are not consistently bearish for stocks. Falling oil prices after unusual spikes or bubbles (1990 Iraq war, 2008 commodity bubble – red shading) have a bigger effect on stocks than falling oil prices after a periods of consolidation (gray shading). The 2014 meltdown came after a year of sideways trading. If history can be used as a guide, stocks are likely to hold up despite the oil meltdown. The ominous Hindenburg Omen showed up multiple times in December. The media has published numerous Hindenburg gloom and doom articles in recent years. The most recent Hindenburg clusters occurred in May/June and August 2013 without effect on stocks. 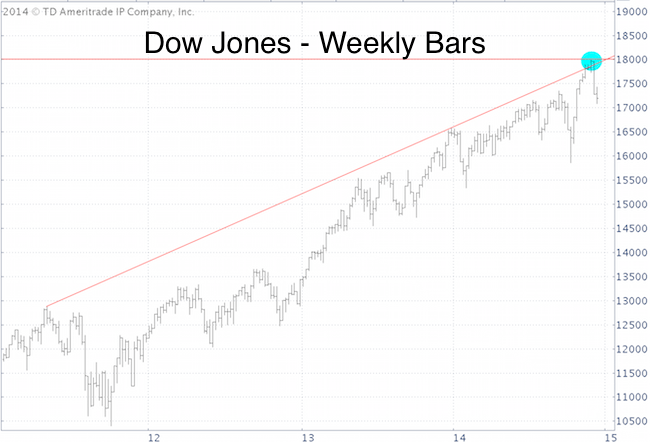 A number of requirements need to be met to trigger the Omen, one of them is a spike of new NYSE highs and lows. Declining oil prices sent many energy stocks to new lows. Those new lows contribute to the Hindenburg Omen requirements and the resulting signal. According to JP Morgan, oil firms account for 18% of the high yield bond market, which explains the 10% drop in junk bond ETFs like JNK (detailed analysis of JNK is available to Profit Radar Report subscribers). The rest of the report along with detailed analysis for U.S. stocks and oil is available to subscribers of the Profit Radar Report. The Energy Select Sector SPDR ETF (NYSEArca: XLE) lost as much as 28.57% from June to December. Every attempt to go bottom fishing was greeted by further losses. Turns out the $50 target wasn’t all that ambitious after all (actual low for crude oil futures was 53.60). It appears like oil will test the 50 level next year. For now, the Energy Select Sector SPDR ETF (NYSEArca: XLE) chart looks more promising than oil. 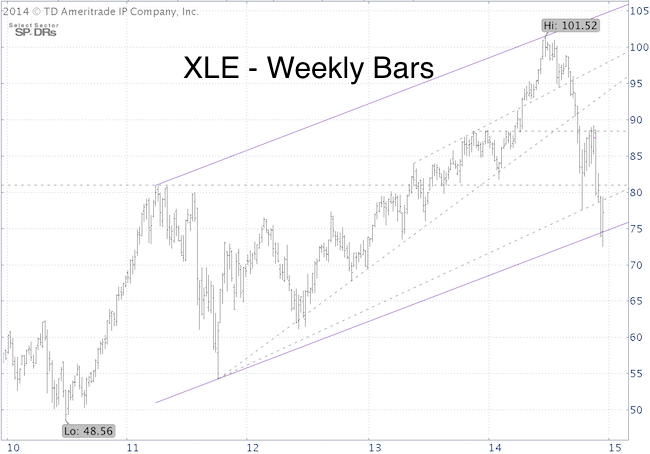 The weekly XLE chart below includes the trend channel (purple lines) along with helpful prior support/resistance levels (dashed gray lines). XLE dipped below the trend channel last week and closed back above it on Wednesday. This is the first encouraging sign for XLE. Yesterday’s Profit Radar Report spells out what’s needed next for this fledgling bounce to gain momentum. It’s been an ugly December for the global economy, and many believe it will get worse. However, not all is terrible. There are some positives. Patience may be rewarded as stocks gyrate at a near-term inflection point. As far as Wall Street is concerned, this may well be the most exciting week of the year. Wide S&P 500 swings have stretched the 5-day trading range (ATR) to the second highest of the year. All this is happening against a backdrop of imploding oil prices, a Russian ruble crash and cratering junk bonds. And, by the way, volatility (NYSEArca: VXX) is up too. The market is trading heavy and seems to want to continue lower. However, bullish seasonality may hold back the correction like a leash holds back a wondering dog. This week is triple witching Friday. Since the CME introduced S&P 500 futures in 1997, the futures finished triple witching week higher 96.8% of the time. 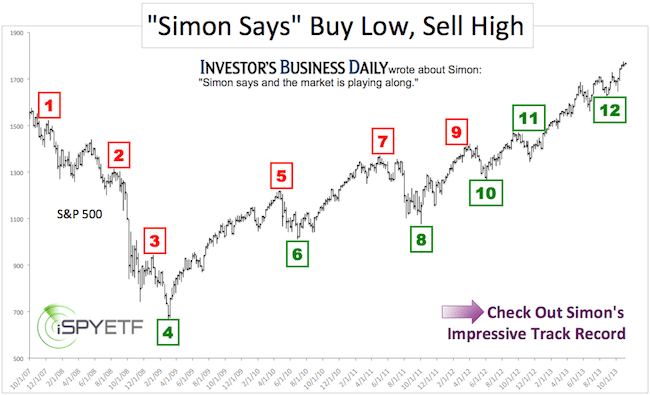 Despite the cantankerous drop from the December 5 highs, the stock market did not display the classic signs of a major market top prior to the reversal. There is a minor 6-day bearish divergence between the S&P 500 (NYSEArca: SPY) and secret sauce, but prior market tops were preceded by months, not days of divergences (more details here). These conflicts caution that the market is in somewhat of a ‘black hole.’ More down side is possible, but the final top doesn’t appear to be in yet. The Russell 2000 (NYSEArca: IWM) may be the canary in the mine, as it find support exactly where it should have. As a simple rule of thumb, only a drop below yesterday’s low will unlock significantly lower price targets. There’s a fair amount of uncertainty, and all that on FOMC day. Small Caps – The December ‘No Guts No Glory’ Trade? Historically, December is a good month to own small caps. However, the tendency for a nasty mid-month pullback is often overlooked. Will this correction send small caps even lower, or is it a good time to buy? December has a reputation to be a good month for stocks, but that reputation is taking one on the chin as we speak. In reality, December sports some seasonal ebbs and flows often ignored. Stocks tend to rally in the first part of the month, correct in the middle and finish strong. 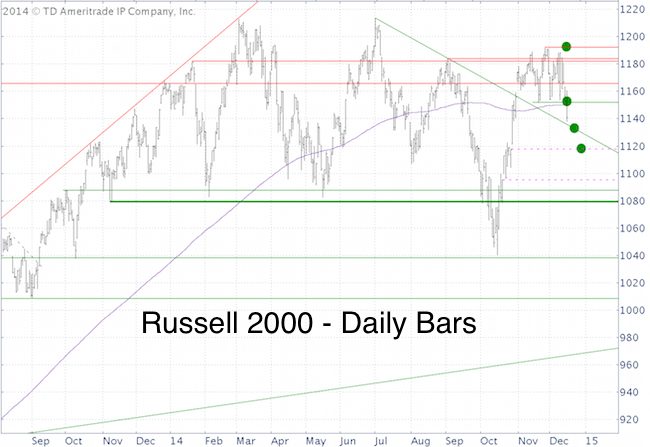 The updated Russell 2000 chart below includes the green circles mentioned in the December 7 PRR update. The Russell 2000 in particular and stocks in general fell more than many expected, turning the potential year-end buy signal into a ‘no guts, no glory’ trade. It certainly takes guts to push the buy button after this nasty sell off. Although seasonality suggests a favorable outcome for small cap buyers, it’s prudent to wait for technicals to confirm the initial stages of a reversal. The iShares Russell 2000 ETF (NYSEArca: IWM) and Direxion Daily Small Cap Bull 3X ETF (NYSEArca: TNA) are two ways to play strong year-end small cap seasonality.